Type C when prompted for a disk drive letter, then Esc to start a new game. 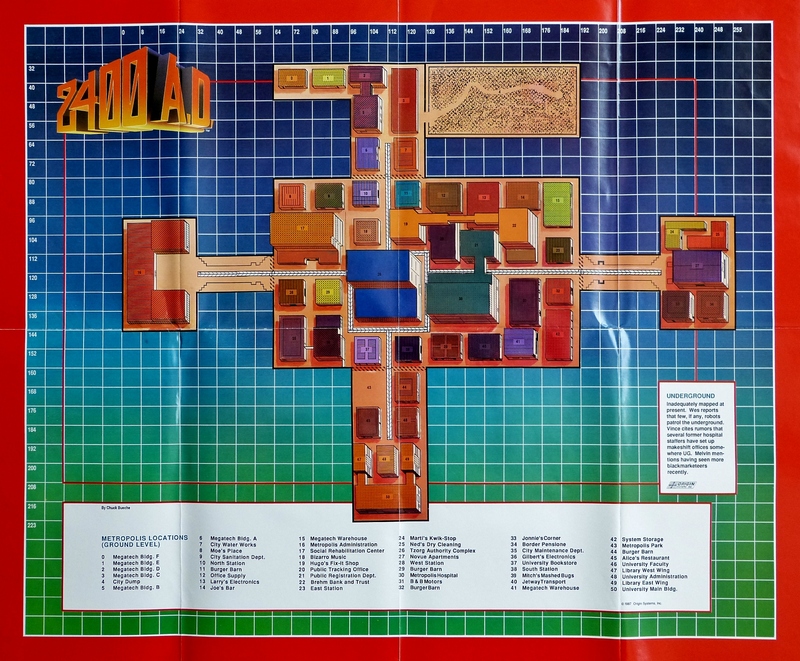 Get the map at the Museum of Computer Game History. This 1988 Origin Systems game was designed by Chuck "Chuckles" Bueche, Origin co-founder and the real-life inspiration for every Avatar's least favourite jester in the Ultima series. It was to be the last of Bueche's games released by the company, and suffered disappointing sales - so much so that both its sequel, 2500 A.D., and a C64 conversion headed by John Romero were canned. 2400 A.D.'s sci-fi plot casts you as a computer specialist who has been shipped to the occupied mining planet of Nova Athens. The city of Metropolis was once a centre of learning and research, but has been crushed beneath the boot-heel of the evil Tzorg (assuming they wear boots). For logistical reasons, the Tzorg themselves have withdrawn from New Athens, leaving it under the watchful eye of an army of robots, programmed to viciously oppress the planet's human population. For good measure, the Tzorg turn the city's botanic gardens into a rubbish tip before they leave, just so you know they mean business when it comes to Evil Aliening.